I’ve made sushi cakes before, but this time I wanted to take it a bit further and create a giant piece of a sushi roll!! 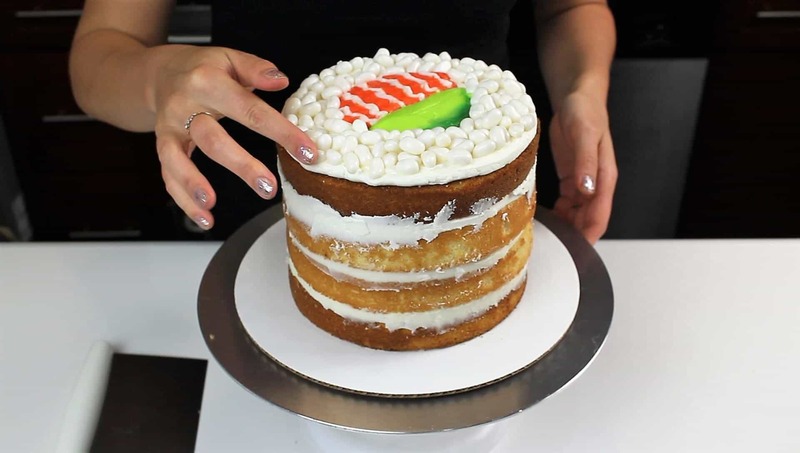 The key to making a good sushi cake is having jet black frosting, and perfectly sized candy “rice.” Through trial and error, I’ve found that white jelly beans (the coconut flavor, to be specific) work best! I get mine at my neighborhood candy store, but if you can’t find them you could also use white sprinkles, or shredded coconut. For the jet-black frosting, I like to make chocolate buttercream using black cocoa, and then add a bit of black gel food coloring. 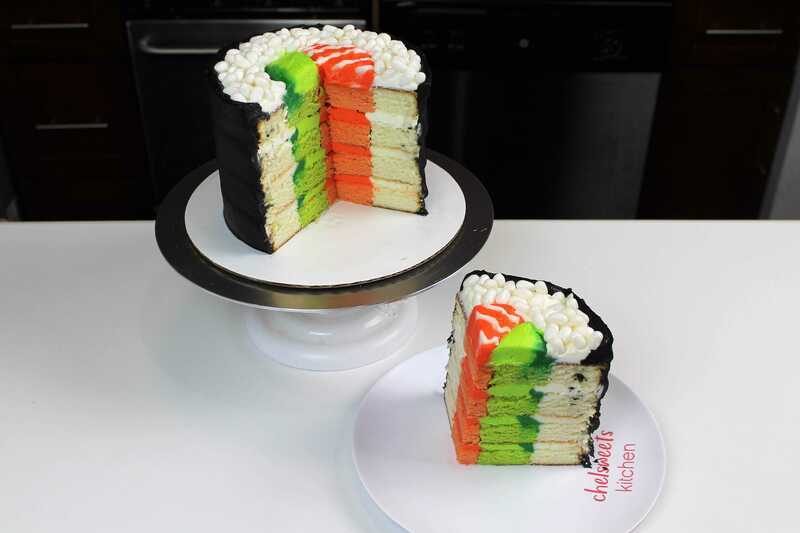 Use the cake recipes above to make four, 8-inch cake layers (white), and two 8 inch square layers (orange and green). Chill the layers in the freezer once baked and cooled, to make them easier to frost and cut (I wrap my layers in saran wrap, and freeze them overnight, then allow them the sit out for about 20 minutes before frosting). 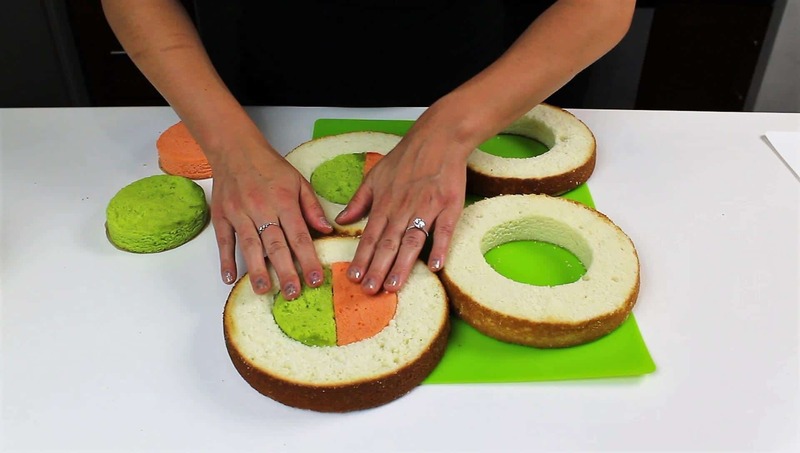 Use a 4 inch circle cutter to cut out 2 orange cake circles, and 2 green cake circles. Cut each circle in half. Use the same cutter to cut out the centers of the four cake layers. Take one half circle of orange cake, and one half circle of orange, and place them into the open center of the white circle layers. Once the buttercream is prepared and colored, place each color into a piping bag. To assemble the cake, pipe the colored buttercream onto each layer to correspond with the color of each cake layer. 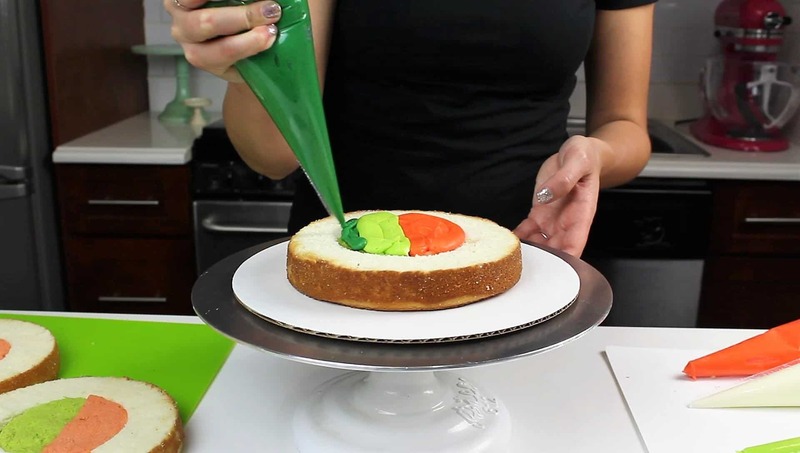 Begin in the center with the orange and green frostings, and then use white frosting to pipe around the colored frosting. Repeat until all four cake layers are stacked, then repeat on top of the cake. Add white jelly beans onto the white frosting. Place the remaining white buttercream into a piping bag with a very small opening (1/2 cm), and pipe thin lines into the orange frosting, to look like the fat of the salmon. Smooth any overhanging frosting, and chill the cake for about 5 minutes in the fridge or freezer. Once the frosting is firm to the touch, apply a second, thicker layer of black frosting onto the sides of the cake, and smooth using a bench scraper. You can see a full tutorial on how to frost a cake with smooth sides here. Thank you for such a detailed tutorial! 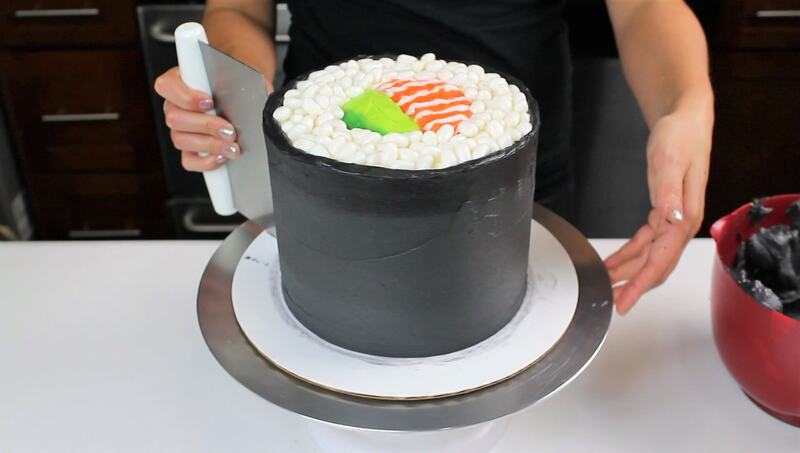 Making this for my daughters 6th sushi theme birthday party.